The power of Google Scholar as an academic search engine lies in the various hidden gems it contains. Digging a little bit deeper into the features it provides, you will definitely discover some amazing functionalities indispensable for academics and research students. We have already covered a number of these features in previous posts which you can access through this page. Today, we are introducing you, in case you don’t know it yet, to another useful functionality integrated in Google Scholar.The citing feature is by far one of the hacks we love the most about Google Scholar. 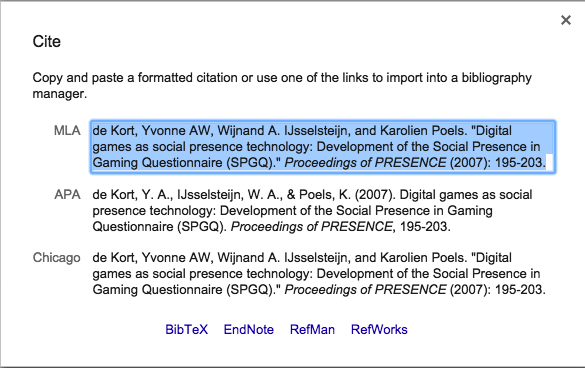 The Cite button that appears under links in a Google Scholar search result allows you to generate citations of that reference with a single click. These citations are offered in 3 main formats: MLA, APA and Chicago. And if you use a citation manager such as BibTex,Endnote, RefMan, or Reworks, you will find links to easily export your citations to these managers. 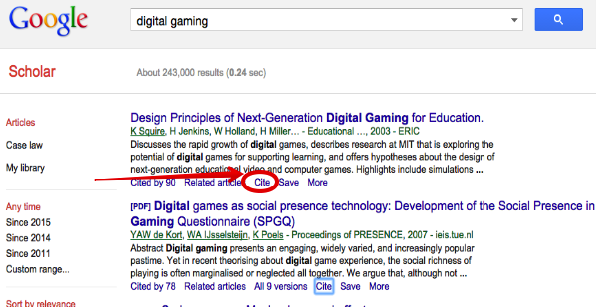 To locate the cite button, head over to Google scholar and conduct a search query. Look for “Cite” under the links that are displayed in the search results as shown below. Thanks to Mashable for reminding us about this excellent feature.